Written by Stein on Pitcairn Island, December 2013. I can only apologize for being so late with this report. But it was another busy summer! 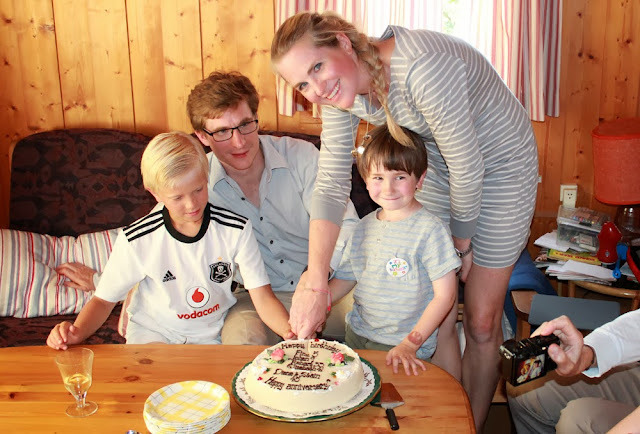 After that long sail from Panama to Florida and a brief visit to Elisabeth, Hugh and their boys in London (Report No 64, see below), we were back home in our apartment, Fjordsvingen 22, Gullaug near Drammen, on 28th April in time for the miracle of late spring. 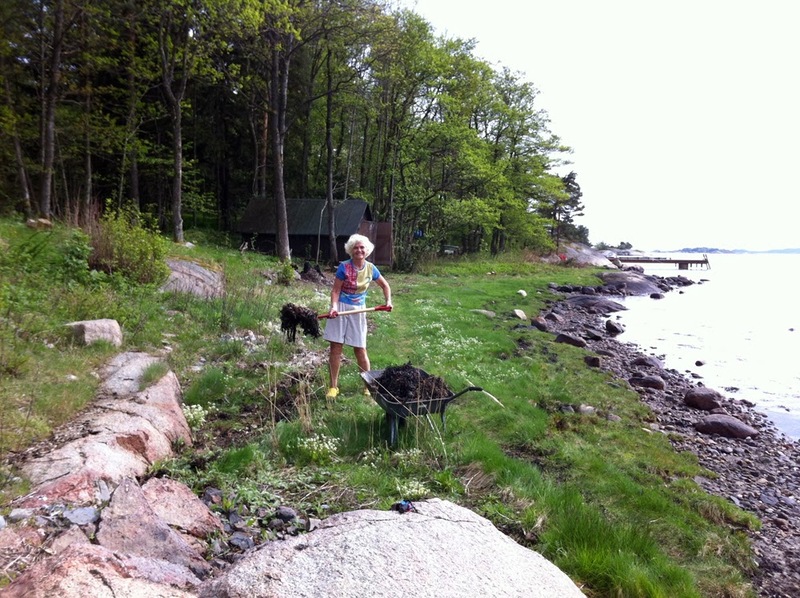 May and June are such beautiful months in south Norway - flowers popping up everywhere and birds returning to forests and shores. I started back at my part-time, post-retirement work doing two days of cardiology out-patient clinics weekly at Drammen sykehus, a practice I really like. Diana, however, does not want to do any more regular eye-work, although she is in fact doing some right now here at tiny Pitcairn – more about that in reports to follow. 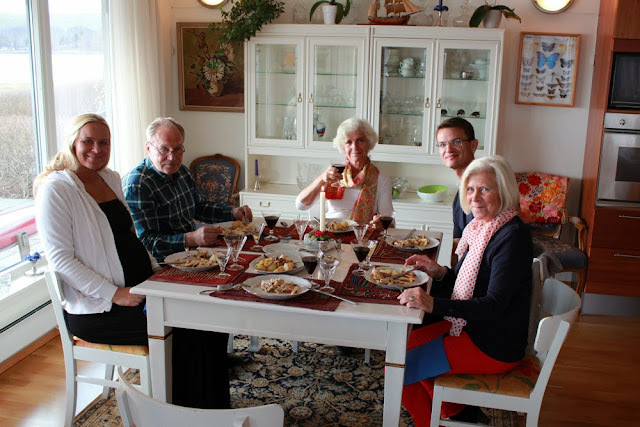 She can be excused, normal retirement age in Norway is 67 and on May 1st she rounded 69, Martin and Tonje, upstairs friends and neighbours Dagmar and Christian helped me to celebrate a most unusual and loved wife, mother, mother-in-law and friend. With our children agreeing, Diana and I had decided to put up the cottage at Veierland for sale. Not an easy decision as I have always loved the place and have spent a lot of time there since I was 11 years old. But it was in need of repair and maintenance, is inconveniently placed on an island (for senior citizens, especially) and it was not suitable for any of our children to take over. So since early August, our old cottage at Veierland has had new owners, an energetic couple from Oslo with three younger children. They love it there already and we are sure that both the place and the relationship to our neighbours will be well looked after, and they say we are welcome to come and check this out for ourselves any time! 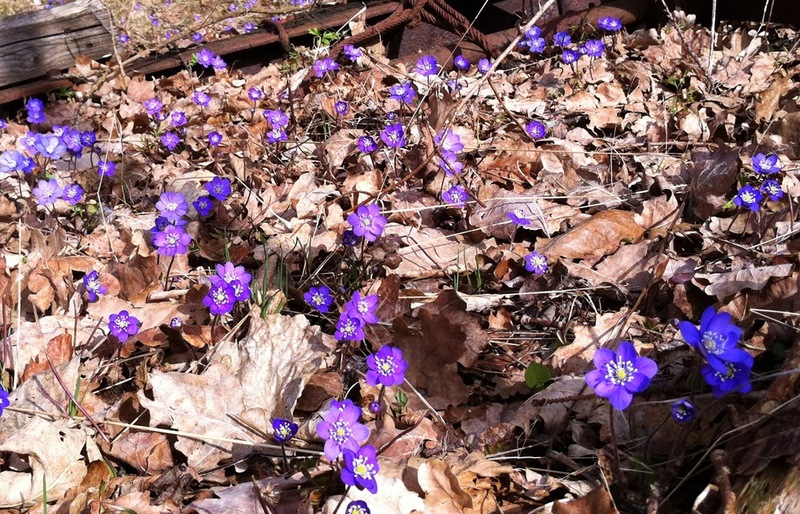 So spring and summer meant a lot of work to prepare the place for new owners. But July had just about the best weather ever recorded in our part of Norway, and we were able to celebrate and say good-bye properly with a long string of family and friends visiting. The first family gathering was 15th July when Diana and I could celebrate 45 years wedding anniversary. 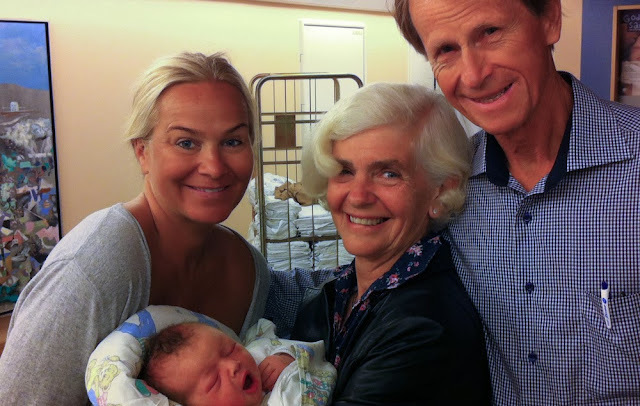 On the same day our “English” grandson Finn was 5, and in July also our daughter Elisabeth, son Robert and Norwegian grand-son Johan have their birthdays! The cake had a lot of names on it! on the same day as it is 45 years since Diana and Stein were married in Glasgow University Chapel! 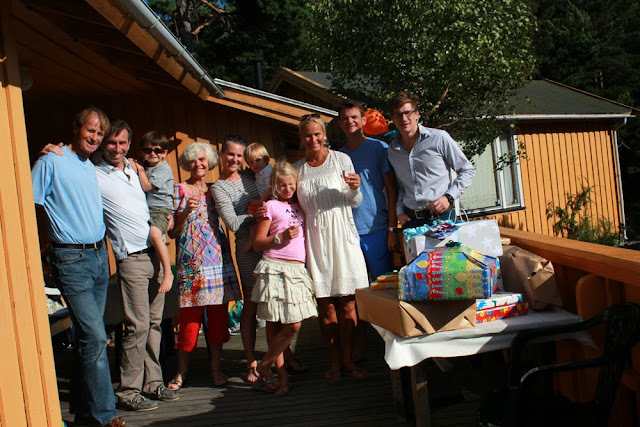 Celebrating ourselves and the weather: Stein, Hugh, Finn, Diana, Elisabeth, Soren, Hedda, Tonje, Martin and Robert. Johan is taking the photograph and Oscar is asleep. Also we are saying goodbye to Veierland together. Diana did a lot of travelling! In between getting Veierland ready, and sailing again in the autumn, Diana fitted in some trips abroad. 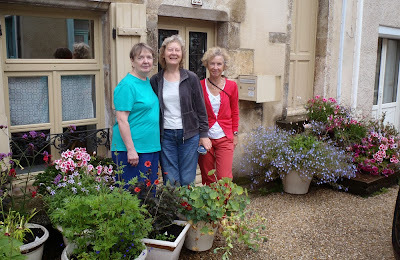 One was for a girls-only medical reunion combined with seeing friends and family in England and Scotland, another was an old school friend trip with Sandra and Fiona to see Liz in France (becoming an annual tradition). 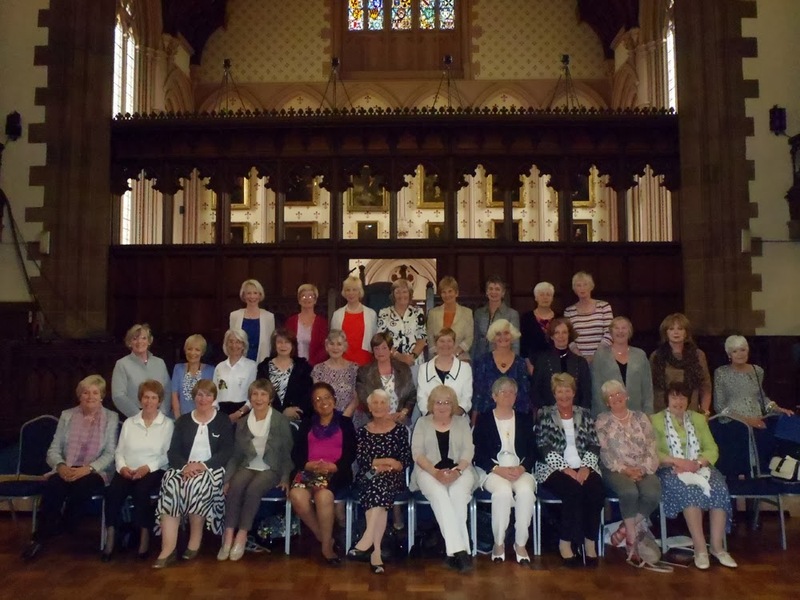 Beta Club Medical girls-only 45 year reunion, Bute Hall, Glasgow. Diana in 2nd row, 5th from right. The annual visit to Liz in France with two other Hutchie Girls Fiona (Aberdeen) and Sandra (Glasgow). 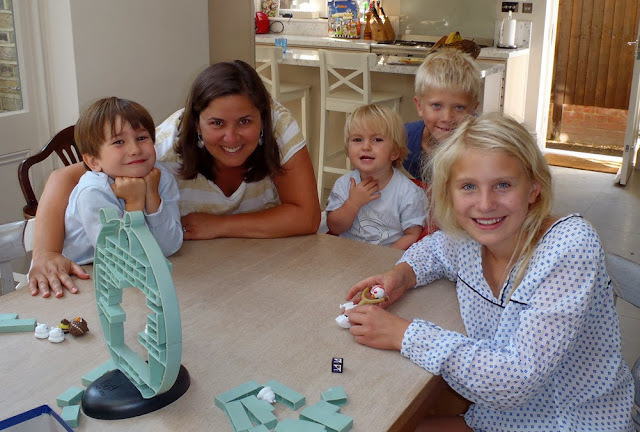 She also took Hedda and Johan to London to see their cousins Finn and Soren for a long week-end. 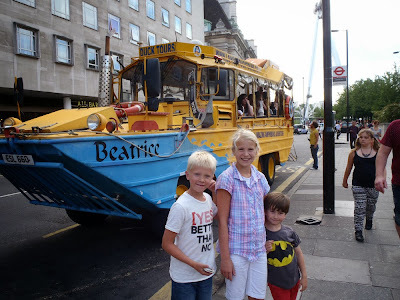 One highlight there was a tour on Beatrice, an amphibian vehicle driving both in the streets of London and on the river Thames. Beatrice is an old “girl” who first took part in the D-day Invasion in Normandy in World War II! The old amphibium vehicle took them for rides both in the streets and on the river - very popular! Johan and Hedda from Norway. 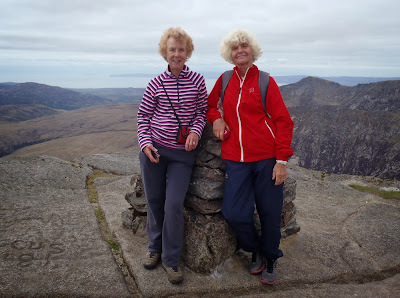 In august Diana also went to Edinburgh Fringe Festival where she was joined by her cousin Tom, they plan to do a play together at the next Fringe in 2014. 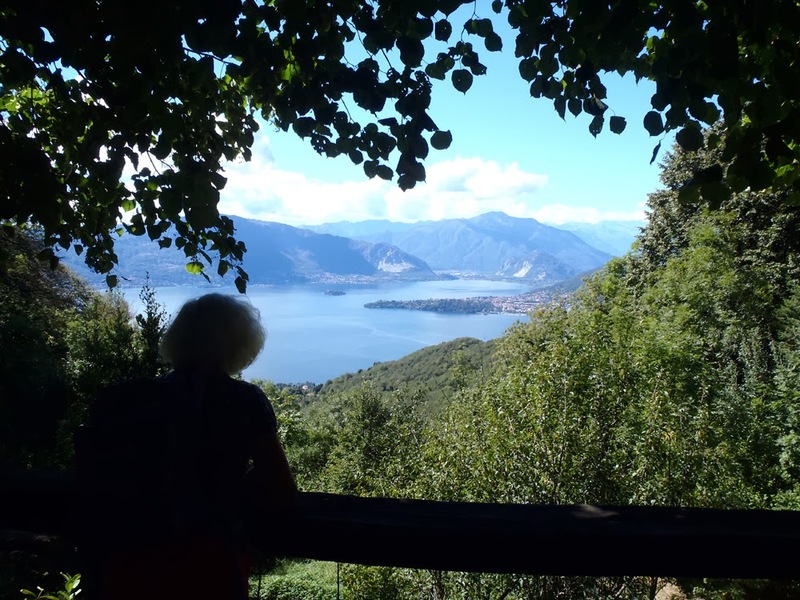 Hillwalking in Varese, Italy and hillwalking in Rondane, Norway. In September Diana came to cheer me on when I rowed in the World Veteran (Masters) championship in Varese, north Italy. 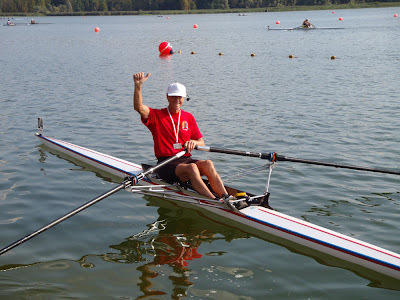 A win in the single sculls class G (65-70) for 3rd year running. 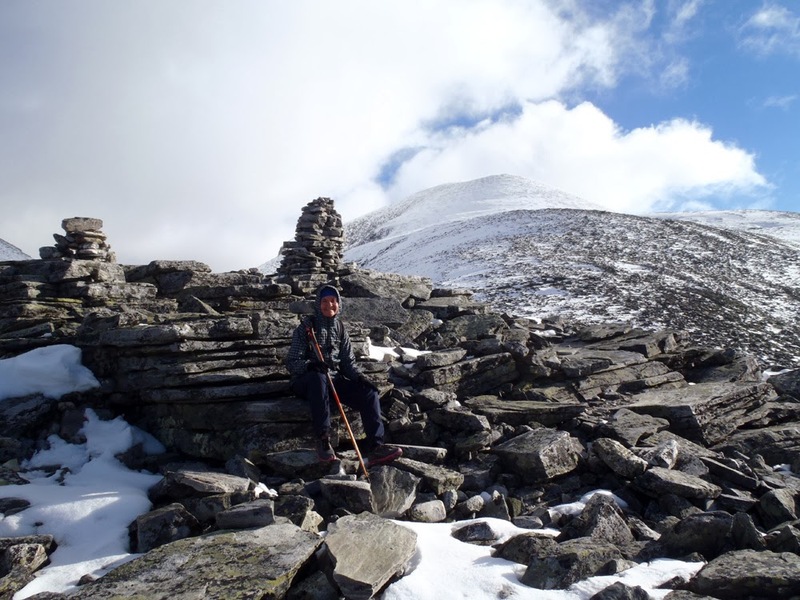 Tough going in strong and freezing winds halfway up Storronden. Later that month back home we drove up to Gudbrandsdalen and Rondane to stay at the Rondvassbu Turishytte and do some hill-walking before visiting my cousin Stein “Buster” and other family members in Oppdal and Trondheim. Another 2013 challenge was to reduce the amount of stuff we have collected, partly gathered ourselves over the years, and partly inherited from Stein’s parents in Sandefjord and Veierland. As our apartment is not very big, we have had to rent two City Storage rooms in Drammen. Diana has done a lot of sorting and organizing mostly by herself, but all our children have also visited the stores and chosen items. Books and many other items we have had to throw or give away and some we finally brought in the car filled to the brim inside and on the roof-rack across the North Sea to Robert in Cambridge and Elisabeth in London. This was early in October. Finally, we only needed to hire one room. While in England with our own car we took the opportunity to visit Diana’s family in Leicester and Lincoln as well as other friends we had not seen for a long time. 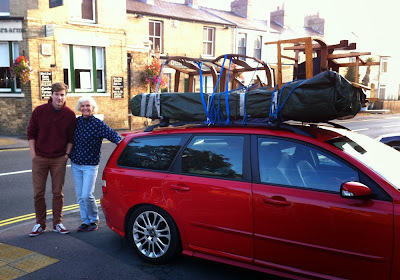 Arriving at Robert's with the car full of stuff inside and on top. 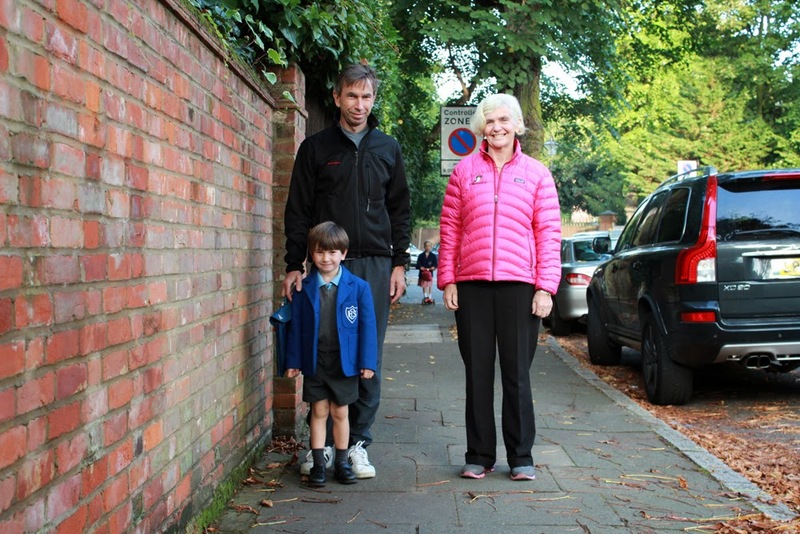 Taking the opportunity to follow Finn to school. Hugh and Diana. 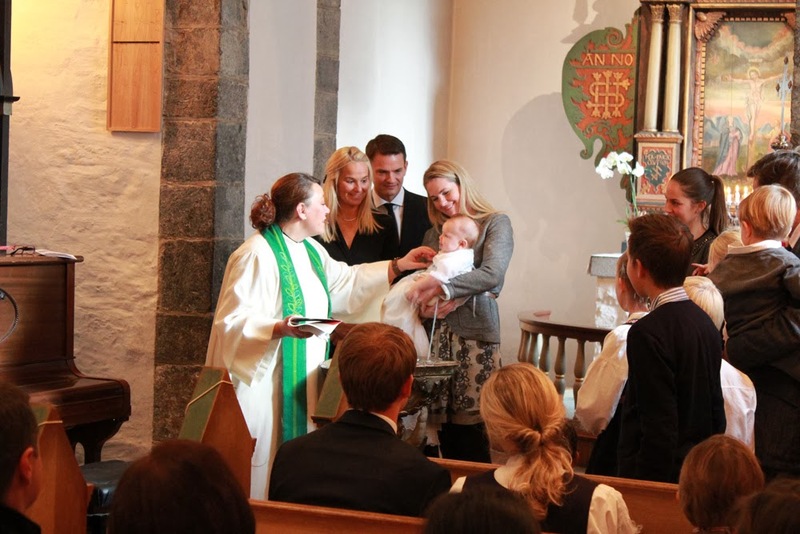 20th October was another big family celebration in Stabekk in connection with Oscar’s christening in Haslum kirke. Elisabeth and Hugh and their boys and Robert came across once more, and we met many new members of Tonje’s family. The Christening, Haslum Kirke. Elisabeth is Godmother. 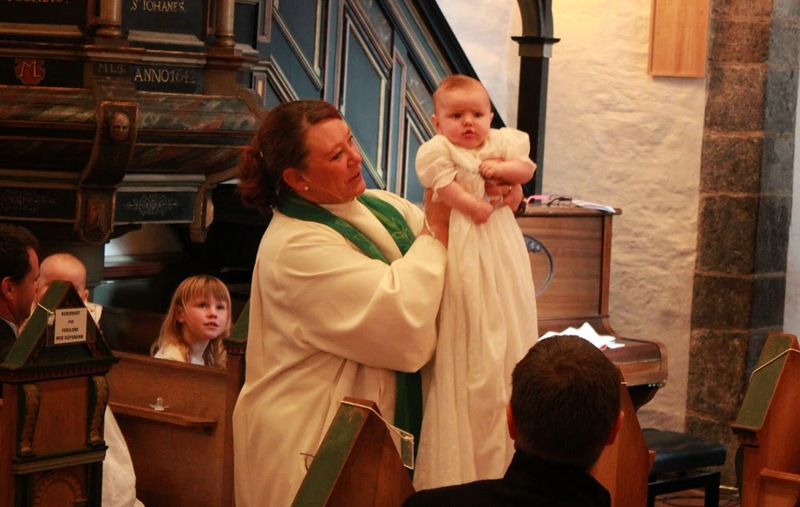 The Minister presenting the now christened Oscar to the congregation. Close-up of a wee charmer! A final burst of activity was cleaning and preparing our apartment for renting out for 8 months. We will in fact be away for nearly ¾ year as we are both sailing White Admiral all the way from Florida to Norway and visiting Pitcairn Islands in the South Pacific for 3 months in the middle, when the yacht will be waiting for us in Bahamas. But 26th October all was done, and we were off again, first staying overnight with Tonje, Martin and Oscar, then next morning got an SAS -plane from Gardermoen to Heathrow and Elisabeth, Hugh and the boys in London. 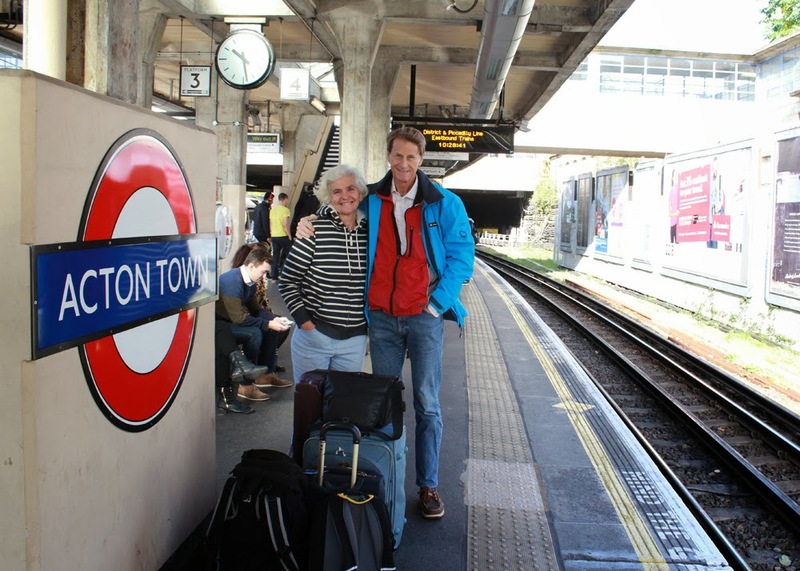 Very nice to be with our London family again, even though it was just for one day. Morning 28th we were off to Heathrow and the flight to Jacksonville via Miami, a flight we nearly missed due to a violent storm that hit London the same morning. Fallen trees suddenly blocked the rails and stopped the Heathrow Express as we were standing at the Acton station, where Elisabeth has dropped us 10 minutes earlier. Ignorant bliss at Acton Town station. Another passenger took the picture. But Elisabeth was fortunately able to come back and picked us up once more, and drove us out the M4 motorway to Terminal 5 just in time. And off we flew, west with the sun, for more adventures on White Admiral in Florida and Bahamas.